Many bird lovers put out feeders full of seed for their feathered friends—but those feeders may also attract predators that eat eggs and nestlings. The researchers behind a new study in The Condor: Ornithological Applications tried to untangle these relationships through a four-year study of songbird nests, bird feeders, and predators in urban Central Ohio. Feeders may attract more predators to an area, but the food can also satiate predators so that they're less likely to target nests. 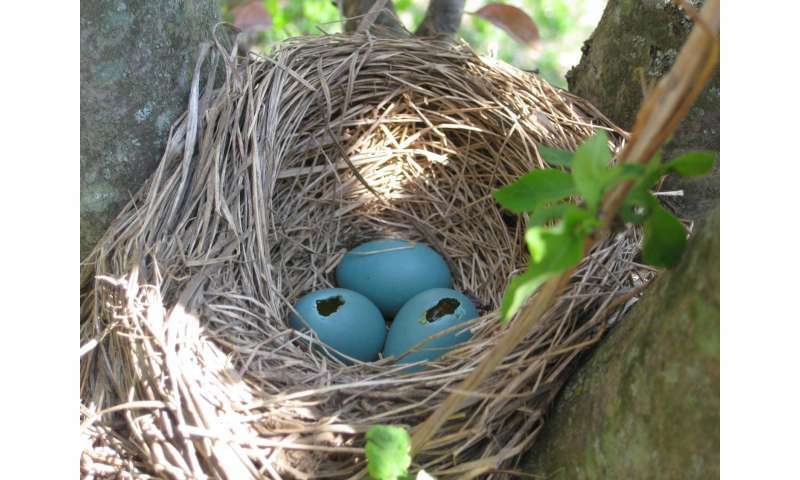 To learn more, Jennifer Malpass of The Ohio State University and her colleagues tracked the relationships between the success of American Robin and Northern Cardinal nests, the presence of potential nest predators like squirrels, domestic cats, and other birds, and the presence of bird feeders in the area. Relationships among feeders, predators and nest survival were complex —areas with lots of feeders had more cowbirds and crows, birds that are known to prey on songbird nests, but that didn't generally affect the success of the nests the researchers monitored. "One key message of our work is that there may be species-specific responses to anthropogenic foods," says Malpass. Robins did experience increased nest predation in one specific set of circumstances, when neighborhoods contained both high numbers of bird feeders and large concentrations of crows. Human-dominated environments, it turns out, are complicated and variable, not lending themselves to simple generalizations. To collect their data, Malpass and her colleagues spent four years monitoring songbird nests and conducting surveys for potential nest predators in seven residential neighborhoods in Columbus, Ohio. "One of the challenges of conducting research in the suburban matrix is gaining access to private property," says Malpass. "In our experience, most of the residents in our focal neighborhoods were willing to allow access to their yards and had a positive experience being part of the project." "Even with over 50 million Americans feeding wild birds and other wildlife around their homes, our scientific understanding of the practice continues to lag," according to Millikin University's David Horn, an expert on wild bird feeding who was not involved with the study. "The study by Malpass, Rodewald, and Matthews increases our understanding of how the provision of supplemental food may influence predator abundance and nest survival of two common songbird species."